Our galaxy (200,000 light years across) contains about 300 billion stars. All stars are born from collapsing clouds of gas and dust called nebulae. 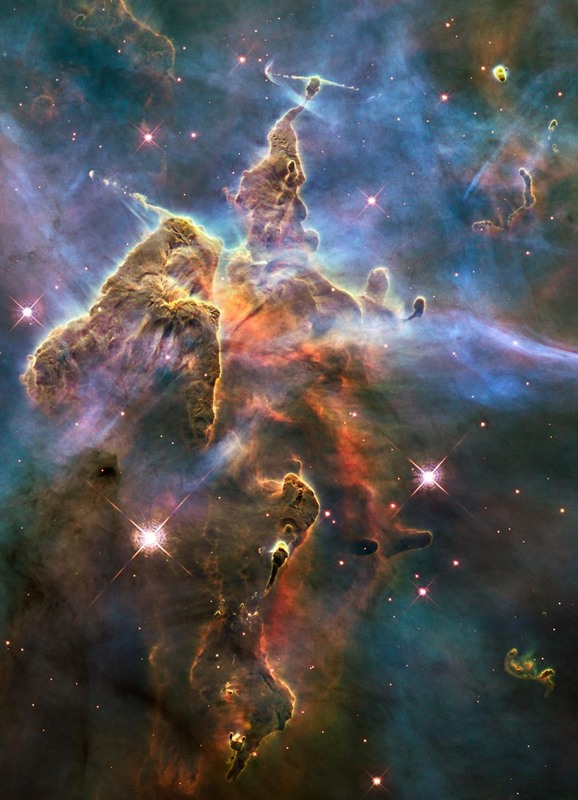 Shown above, the Carina Nebula (7,500 l.y. away) contains some of the youngest and most luminous stars known in the Milky Way. Photo by NASA/ESA‘s Hubble Space Telescope. UY Scuti (9,500 l.y. away) is the largest known star in the Milky Way. If placed at the center of the Solar System, this red supergiant would engulf the orbit of Jupiter. Its core is expected to collapse in a supernova explosion. The Crab Nebula is a supernova remnant that is about 1,000 years old. SN 1572 is a supernova remnant that is about 450 years old. The Jellyfish Nebula is a supernova remnant that is about 10,000 years old. The Spaghetti Nebula (3,000 l.y. away) is a supernova remnant that is about 40,000 years old. 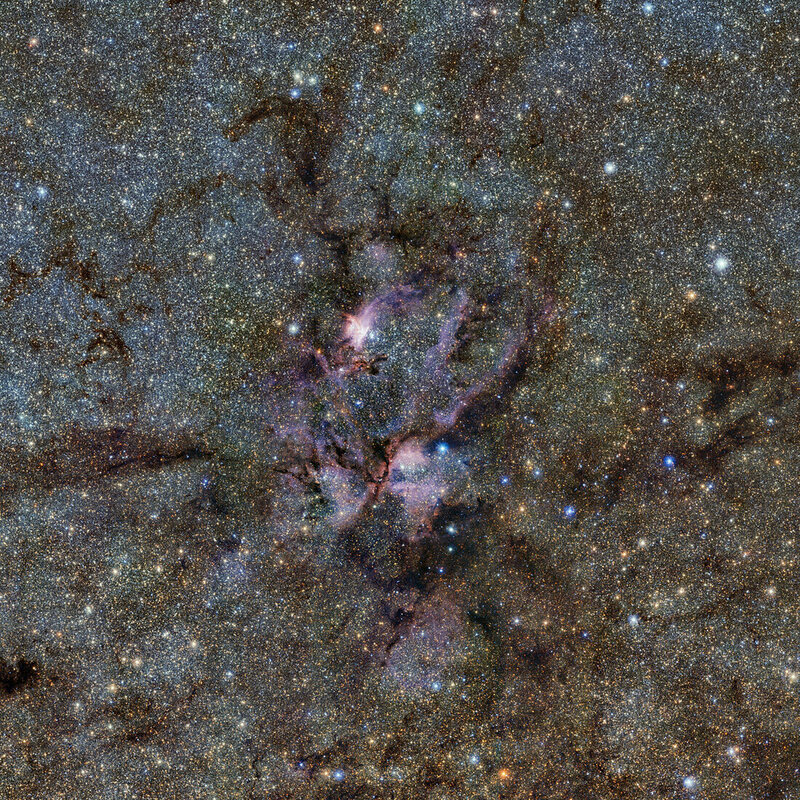 The Lobster Nebula (8,000 l.y. away). The Tarantula Nebula lies within the Large Magellanic Cloud (163,000 l.y. away), the largest satellite galaxy of the Milky Way. Photo by Joseph Brimacombe. The Small Magellanic Cloud (197,000 l.y. away) is the third largest satellite galaxy of the Milky Way. The Andromeda Galaxy is the nearest major galaxy to the Milky Way. This structure is 2.5 million l.y. away and contains about 1 trillion stars. It is expected to collide with the Milky Way in 3.5 billion years. NGC 5907, an edge-on spiral galaxy about 53.5 million l.y. away. Image of the giant galaxy IC 1101, taken by the Hubble Space Telescope’s Wide Field and Planetary Camera 2 at 702 nm. It’s thought that almost every large galaxy, including the Milky Way, has a supermassive black hole at its center. The image above shows Galaxy NGC 1068, whose core (inset) contains a supermassive black hole. The black hole of quasar H1821+643 is one of the largest, with an estimated mass of 30 billion Suns and a diameter 28 times the span of the Solar System. The Hubble Ultra-Deep Field is an image of a region of space that is just one thirteen-millionth of the total area of the sky (smaller than a 1 mm by 1 mm square held 1 meter away). An estimated 10,000 galaxies are visible. Image source. In a computer simulation of the cosmic web, galaxies form from gas (orange) that cluster along filaments of dark matter (blue). The region in this image spans about 350 million l.y. The location of our own galaxy (red dot) on the fringes of the Laniakea Supercluster, our filament of the cosmic web. Along its major axis, this supercluster spans 520 million l.y. When you think about it, there is nothing more absurd than the fact that we exist. On the atomic scale, we are 99.999999999999% empty space. On the cosmic scale, we’re just an expanding field of energy. Neurons in a mouse’s cerebellum. Somehow, this energy has assembled itself into an entity capable of pondering its very existence. Somehow, the Universe has become aware of itself. IMAGES IN THIS BLOG ARE NOT MY PROPERTY. IF YOU WOULD LIKE ANY IMAGE CREDITED OR REMOVED, OR IF YOU HAVE ANY QUESTIONS, COMMENTS, OR CONCERNS, PLEASE COMMENT BELOW OR CONTACT ME AT IFTRUTHEXISTS@GMAIL.COM.